Revelation de Chanel Spring Summer 2013 Makeup Collection (available here) - I read about this new collection of Levres Scintillantes Glossimers on Chicprofile a while back. Slated for release some time in March/April, this collection features a mix of new shades as well as repromoted Glossimers and also includes a new nail polish. Last week, pieces from this collection turned up online - at Neiman Marcus and Nordstrom - and I was able to pick up a few of the products. I bought 4 of the new Glossimers - Rose Sauvage, Savage Grace, Crushed Cherry, and Daydream - and the new nail polish - Taboo. I just got these products today, so only swatches and photos for now. There is a lot of shimmer in these products, and depending on the light, the shades can look slightly different. Described as Shimmering Rosewood - looks more warm pink to me. Described as a shimerring dark blue violet, this polish has a fine red and purple shimmer scattered throughout its bluish purple base - gives a lovely duochrome effect under sunlight and warm artificial lighting. I haven't yet had the time to use any of these products, apart from quick swatches, so detailed reviews will take a while. Apart from Crushed Cherry, everything else seems to be shimmery/glittery and not what I would generally pick for myself. Last week while checking out products at the Chanel counter, the SA showed me how wearable the shimmery Chanel Glossimers can look, especially when worn over one of their lovely lipliners, and that's the reason why I bought these glosses. Fingers crossed that they actually do look nice on me! Also, while the colors look pretty dark in the tubes, they do sheer down quite a bit while applying. The nail polish - Taboo - is something I haven't yet made up my mind about. It looked a metallic bluish-purple under regular day light, and I didn't like it at all, but as the day wore on and under warmer lighting the reddish sheen came into play and made the color look really beautiful. 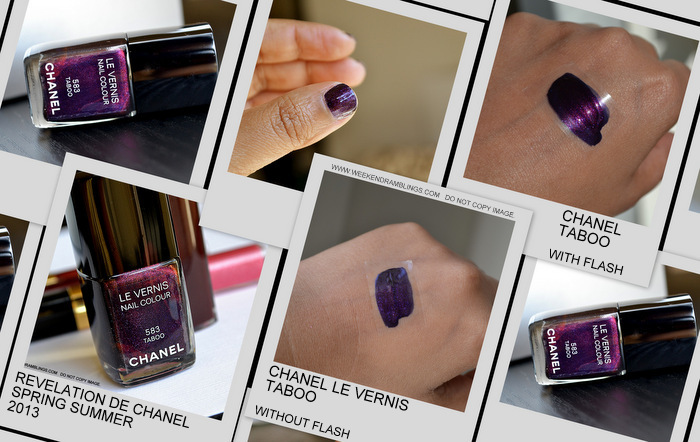 Check The Beauty Look Book for detailed review, photos, and comparisons for Taboo. Products from the Revelation de Chanel Spring Summer 2013 Makeup Collection are currently available online at Nordstrom and Neiman Marcus - just look under the gloss and nail polish categories as there is no separate feature/spotlight on this collection as of now. Links provided for information only and are NOT affiliate links. Information regarding products/shades from Chicprofile. Hii... Lip glosses are so pretty... lovely shades. Which is your fav out these? I cant wait to try some of these! 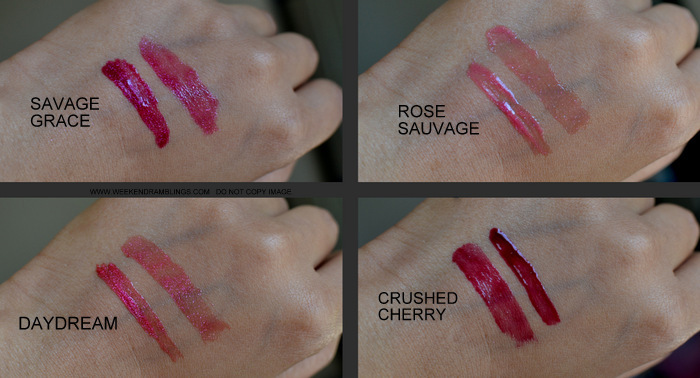 Rose Sauvage is calling my name. That's a great observation regarding all the different and NUMEROUS collections that the brands come out with... It's so difficult to purchase "by seaon" that now I just purchase whatever colour catches my eye. It's a lovely color, isn't it? I tried Savage Grace today - topped over Boots lipliner in Plum - helps the color show up perfectly on my pigmented lips. I used a lip brush to apply the gloss, and it's just the right amount of sheer-pigmented combination.